Acting on a Calcutta High Court order, the State Election Commission extended the last day of filing nomination for the state rural election to Monday between 11 am to 3 pm. Widespread violence and clashes between rival political groups claimed one life while a Congress legislator was among a large number of people injured on the extended date of filing nominations for the West Bengal Panchayat polls on Monday. A number of persons were injured in the clashes that broke out in various districts, with Birbhum and Murshidabad being the most volatile. One person was allegedly shot dead in Birbhum's Suri during a clash between activists of the ruling Trinamool Congress and the opposition Bharatiya Janata Party, while Congress lawmaker Manoj Chakraborty was beaten up with bamboo poles outside the Block Development Officer's office in Baharampur of Murshidabad district. A tug of war broke out between the Trinamool and the BJP over the political identity of Sheikha Dildar, who was found lifeless on the road some distance away from the BDO office in Suri. While the state BJP leadership claimed that deceased was a member of their party's district minority cell and was killed by assailants owing loyalty to Trinamool, the ruling party's district president Anubrata Mondal said the deceased and his family members were Trinamool workers. "Not just Dildar, but his entire family has been with Trinamool Congress for many years. BJP has brought in miscreants from neighbouring Jharkhand to terrorise the locals. He was killed by them," he claimed. In Baharampur, Congress workers obstructed National highway 34 and lifted the blockade only after an assurance from the administration of steps to ensure its candidates could file nominations. In the morning, Congress leader and former Union Minister Abu Hasem Khan Chowdhury's car was allegedly attacked with bricks and crude bombs outside the party's office in Murshiadabad district's Shamshergunj. "As many as eight bombs were hurled at my vehicle outside the party office. The car has been damaged and two of my associates got injured," Abu Hasem said. Meanwhile, clashes were witnessed elsewhere in the districts of Bankura, Hoogly, East Midnapore and South 24 Parganas over the filing of nominations. State opposition parties accused Trinamool of attacking and terrorising their prospective candidates and not letting them near the BDO offices to submit the papers. State Congress president Adhir Chowdhury wrote to the SEC informing him about the hostile situation along with a list of complaints and photographs of violence and urged the panel to ensure appropriate steps. Communist Party of India-Marxist (CPI-M) State Secretary Surjya Kanta Mishra claimed the attacks showed there was no law and order in Bengal. Incidents of violence were also reported from South 24 Pargana district's Diamond Harbour, Budge Budge and Nodakhali where the CPI-M accused "gun-toting goons" of Trinamool of surrounding the local BDO offices and beating up their activists. Denying all allegations of the opposition parties, the Trinamool accused them of enacting drama to scuttle the election process. "They know that people are not with them. So they are enacting drama to jeopardise the poll". 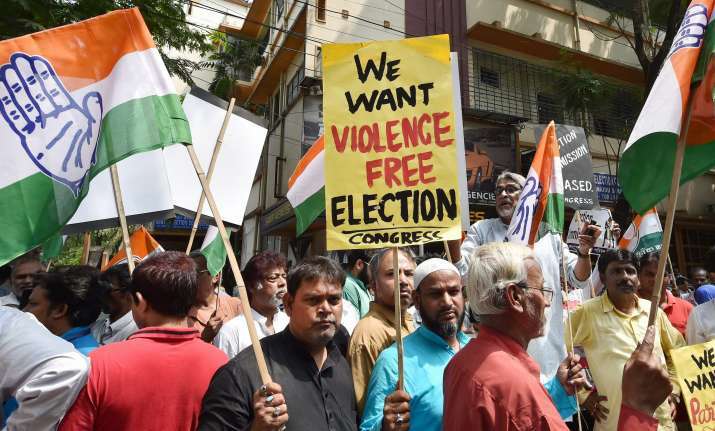 The opposition BJP, CPI-M, Congress and PDS had moved the court, accusing Trinamool of unleashing massive pre-poll violence against their party workers to prevent them from filing nominations ever since the poll process began on April 2. Justice Subrata Talukdar on Friday quashed the SEC's April 10 order that had cancelled the extension of date for filing of nominations, which the poll panel announced on April 9 night, directing it to issue a fresh extended deadline for filing of nominations in consultation with the state government and other stakeholders.